Chinese game company Woniu.com (Snail net...) announced at the China Joy game expo this week the official release of their Chinese fantasy style wuxia mmo called The 9 Yin Sutras (九阴真经). 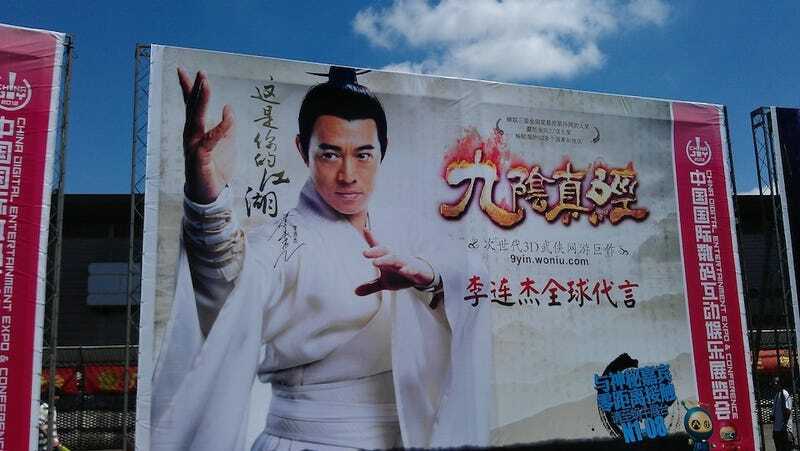 The game at first glance looks like pretty much every other martial arts fantasy style MMO on the Chinese market these days but the one thing that it prominently features is that it is endorsed by martial arts action superstar Jet Li. Li of course isn't exactly foreign to video games: he starred in a video game for the Playstation 2, but this time around Li doesn't even seem to be in the game at all except in the promotional material. Despite the lack of Li in game, the official material from Woniu.com says that the purpose of the game is to spread and preserve the history and culture of Chinese martial arts. However, looking at the gameplay, it feels like the game is mostly trying to preserve the Chinese martial arts fantasy than actual martial arts. On top of that, how exactly can you spread Chinese martial arts history and culture if the game is only released in China?